This morning I faithfully got up to Whittle My Middle. I also discovered I forgot to put my soy milk back in the fridge after making my oatmeal yesterday. 🙁 It was almost a full carton too – what a bummer. Cooked on the stove-top for about 5 minutes, stirring occassionally. 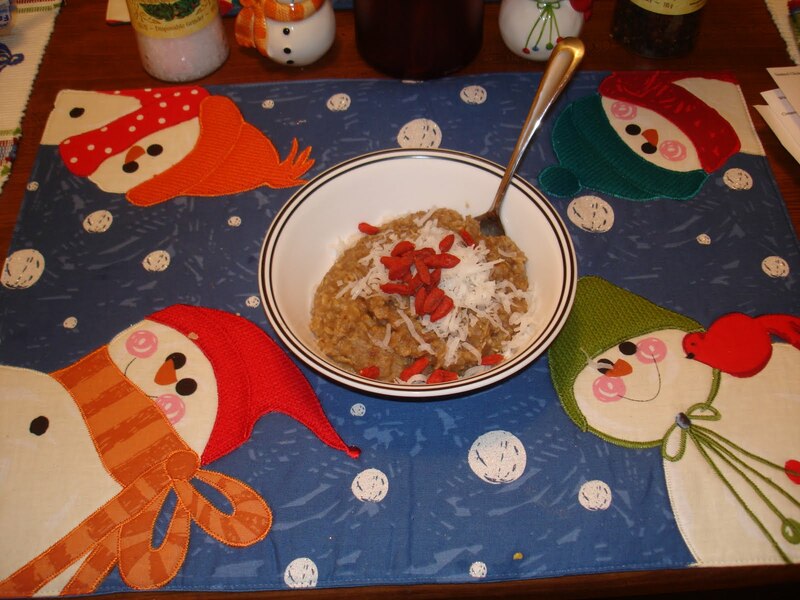 I topped the oats off with a pinch of shredded coconut and some goji berries. So what’s the verdict on my Apple-Pomegranate Oats? Well, the smell was a little funky (not sure if it was the cooking applesauce or pomegranate juice) and the texture left something to be desired (It was again sticky, but that could be the oats I bought as I discussed in my post yesterday). The flavor, however, was to die for! It was the balance of apple and pomegranate. There was a bit of tartness that was offset really well by the sweetened coconut. Overall, this was an awesome breakfast. I’ll definitely be making these oats again sometime soon!